Black chalk and graphite, and brown wash, on laid paper. 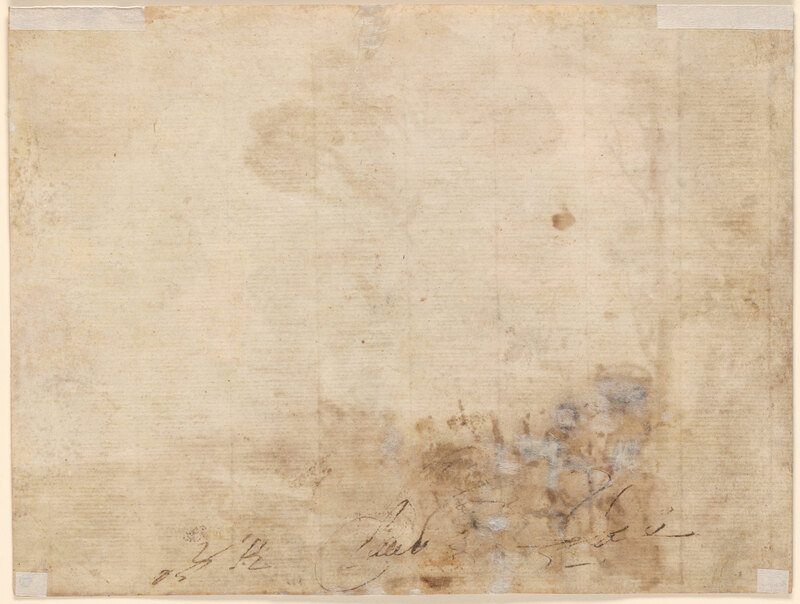 Inscribed on the verso in pen and brown ink, "IVR Claude Gelee". Sir Charles Greville (Lugt 549); George Guy, fourth Earl of Warwick, Warwick (Lugt 2600); his sale, London, Christie's, 20 May 1896, lot 74; Charles Fairfax Murray (1849-1919), London and Florence; from whom purchased through Galerie Alexandre Imbert, Rome, in 1909 by Pierpont Morgan (1837-1913), New York (no mark; see Lugt 1509); his son, J. P. Morgan, Jr. (1867-1943), New York. 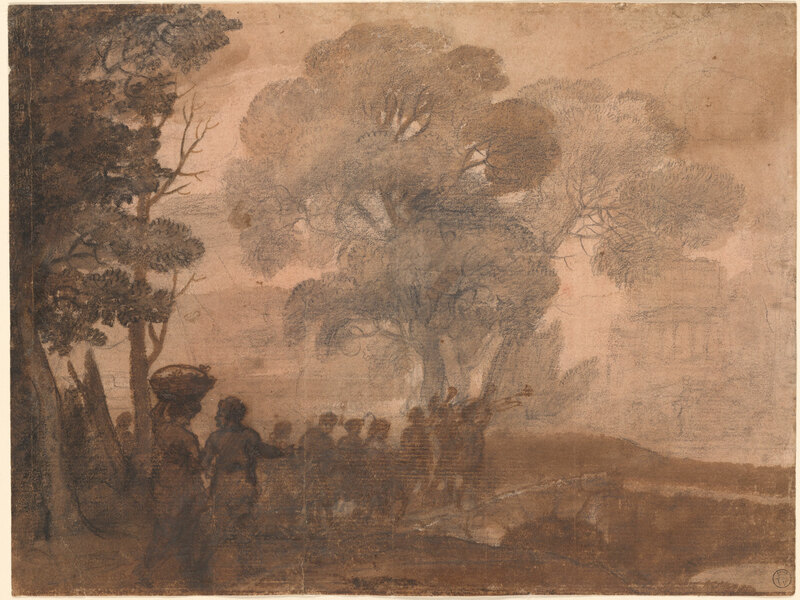 A boisterous group wends its way through a wooded landscape—musicians playing trumpets lead the way, and the rear is brought up by a woman balancing a basket on her head in conversation with a companion. This band of celebrants traverses a stone bridge on its way to a temple in the distance. The subject of pilgrims proceeding to offer a sacrifice at the ancient Greek temple at Delphi was one the artist explored in an expansive landscape painting of 1645. In this drawing Claude focused exclusively on the motif, capturing the liveliness of a crowd that in the canvas would be idealized and subdued. Preparatory sketch for the painting "Temple of Apollo at Delphi", Dorian Gallery, Rome.